When I heard about the opportunity of having a project visit to Nairobi, I felt I had to go. I have been doing volunteer work for RIJ since 2010, but I had never had a chance to see a project, although my work as the Funding Administrator is to evaluate and select projects based on their suitability to RIJ’s funding criteria and the impact they will bring. I listened to my inner wisdom, put the work priorities aside, and decided to join Jane. The project we had funded was called “Mobilising, Organising and Empowering Young Refugees in Nairobi.” The funding was USD 22,000, which was utilized toward providing opportunities for 200 young people so that they could learn English, vocational skills, and build awareness on their legal rights in Kenya. When we arrived in Nairobi on April 6th, I noticed the vast big blue sky. It was different from the hazy skies I used to see in big cities. Then there were colors everywhere. Jane and I spent the weekend by attending two-day trips from Nairobi to Nairobi National Park, Lake Naivasha, and Nakuru. I realized why Africa could be an obsession for many people. Once you see the animals in their natural environment, you would like to be with them forever. On Monday 9th and Tuesday 10th, our project partner, Caritas Nairobi, took us to the areas where RIJ project beneficiaries live. These areas are in the outskirts of the city where somebody from the developed world would immediately be seen an outsider. The first scenes were shocking to me. The poverty I could feel in my body was overwhelming. Some refugees who are not project beneficiaries are afraid to go out during the daytime, as they are afraid that the police could arrest them to get bribes. They sleep in crowded rooms during the day, and they go out at night. I was relieved to hear that the project beneficiaries would be less likely to be arrested because of the school IDs they hold. I was impressed with what they can accomplish with RIJ’s contribution. We visited the English language school where a very enthusiastic teacher was making sure that his diverse range of students who come from different parts of Africa with varying levels of literacy can learn how to speak and read in less than a year. 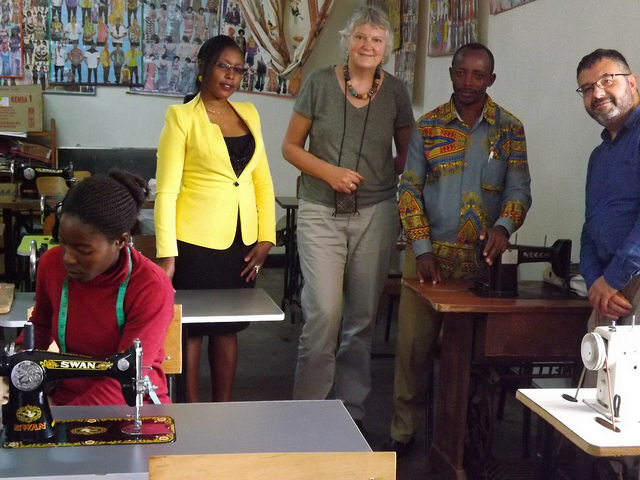 We spoke with a proud teacher in a local community center who teaches attendees how to sew. The works of the students were beautifully designed and created. I could imagine that they can go out and sell their creations in the local market. We also spoke with some beneficiaries who had finished skills training in auto repair and are ready to start their internship, which will help them earn an income by working in garages. We also visited two beneficiaries from the previous years’ training. I was pleasantly surprised that they have now become business owners. Their success proves that refugees can become productive members of the host countries, and they can work towards creating jobs. A valuable lesson for me was to see that a project won’t achieve its goal unless the project partner is well-established in the local community, they run their operations professionally, and they can manage a group of other well-established local partners who can support the overall project. On our last day, we visited UNHCR and other project partners who support Caritas. The lawyers associated with KITUO are working with the police and Kenyan government to ensure the rights of the refugees. The lawyer we spoke with said that the refugees have their phone number, and sometimes the lawyers go to the police stations to free refugees who are arrested unlawfully. Without them in the project, it seemed the benefit from the whole project could be in jeopardy. Since I left Nairobi, I have been thinking about the value of 110 dollars, which is the amount of funds covering one person in this project. In big cities, we can spend that money very quickly. In Tokyo, people can go to a restaurant, a few bars or karaoke, and without realizing it 80-100 dollars would be gone overnight. In Nairobi, for the people who have escaped violence and persecution, 110 dollars marks the border between life and death, captivity, and freedom. More than ever, I am committed to secure that 110 dollars, so that we can invest in somebody’s future, and make it as bright as it can be.